I completed my Masters degree in 2003 and worked at the hospital here in Bowling Green till 2008. I worked in cardiac rehab where people went to strengthen and rehabilitate after heart surgery. During my time the heart doctors were performing over 380 open heart surgeries a year which is more than two-a-day sometimes, WOW!!!! Most of the patients we had were over the age of 55 but some people trickled in under 50yrs old, I’m going all-in to say the younger generation will be having heart attacks and surgery at 35-40yrs because of the lifestyle our “society” has created. Heart disease is the #1 killer among women and the population of the United States as a whole, more people die from heart problems than cancer & accidents combined. These 5 things are contributed and complicated by OBESITY and the reason I quit my job at the hospital. I want to help people before they get high blood pressure, before they have open heart surgery, before diabetes & cancer, before they go to the hospital, before they die!! The only way I know how to help is to educate and show people how, I believe its my responsibility to throw it in your face and help you help yourself!! Physical activity, eating healthy, and limiting tobacco use are three things we can do to help from having a heart attack, once you commit to my program you will find your own strengths and weakness in life, you will know what needs to be done to make changes that make a difference to help you fight obesity. Your doctor says to exercise, so what? so what? go sew buttons on your underwear is what I was told! Something I been thinking about, I had a surgeon who once worked out with me & when ObamaCare was being talked about he kinda took offense to it. So to all of you that your doctor said to exercise, I AM READY FOR THIS!! This Picture was on the front page Daily News and when I saw it my blood boiled!! 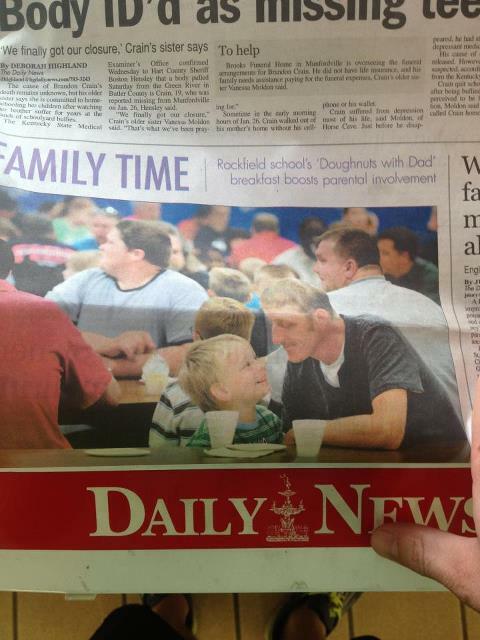 I’m all about family enrichment ideas but how in the world can you promote a doughnut eating program targeting kids? Kentucky school children are fighting the worst Obesity epidemic this country has ever faced and then the Warren Co School Board and Rockfield Elementary promote doughnut eating. Kids in this country today are expected to die sooner than ever before. High blood pressure, type II diabetes, ADHD, irritable bowl, joint inflammation, and all sorts of adult health problems are being seen in the population of the young. I believe the heart attack of today at 45yrs old will be the heart attack at 25 for kids born after 1995. If you are a doctor, nurse or pharmaceutical sales then that’s good for job security but for me it’s very frustrating because our kids are the future. Kentucky is one of the worst in production, income, education but leading the nation in Obesity and health problems. Something has to change and I’m here to help, just ask!! Just my opinion, What’s yours? 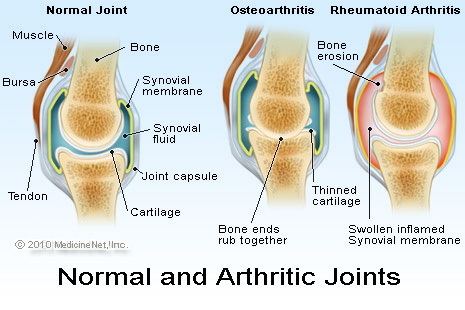 Millions of us deal with arthritis & joint inflammation, the older we get the more prevalent and chronic the pain gets. If you are more than 10lbs over weight or have high blood pressure & stress levels then your flare-ups could happen more frequently. One of the best treatments for arthritis is to give the bones and joints support. Skeletal muscle in the body is designed to support those bones and joints. Sugar, processed foods, acidic drinks, alcohol could all contribute to irritate and activate the arthritis in our bodies. Make sure when you eat that you are nourishing your body with nutrients and getting some type of structured physical activity to stimulate blood flow to lubricate and sooth arthritic joints. This summer I will be using my personal training studio to devote more time to help people with Arthritis and joint pain, If you experience flare-ups & suffer please leave a comment or contact me about getting some SUPPORT, COMFORT & RELIEF this summer.